This month marks the first time I have created art specifically for a set of criteria in a call for art. 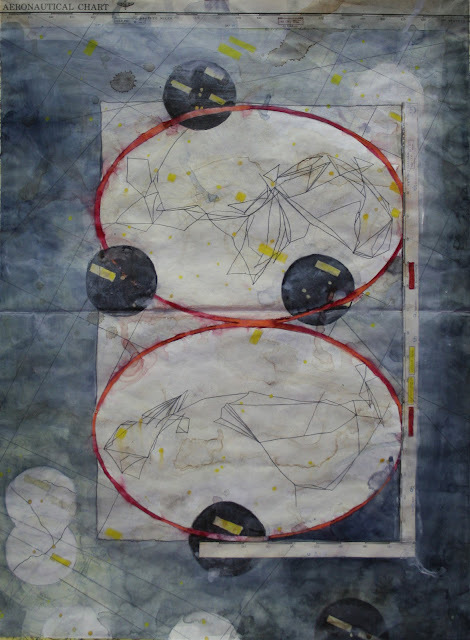 Normally, I make what I want, and then look for calls that seek a similar theme or subject matter to what appears in my drawings and paintings. This month I decided to enter 2 local calls for art. The first one was from Knox Heritage. Each year they hold a photo contest asking for photographs of a particular neighborhood or street in Knoxville. Here are some cool examples of the winning entries from last year. This year Knox Heritage selected Gay Street (all buildings, bridges, and viaducts) one of the main thoroughfares in Downtown Knoxville. The criteria were -- the building had to be directly facing Gay Street and the building, or bridge, or viaduct had to be at least 50 years old. I have photographed Gay Street before. Most of the images I shot on the day I was confronted by the security guard outside the bank were shot on Gay Street, but those buildings weren't old enough. 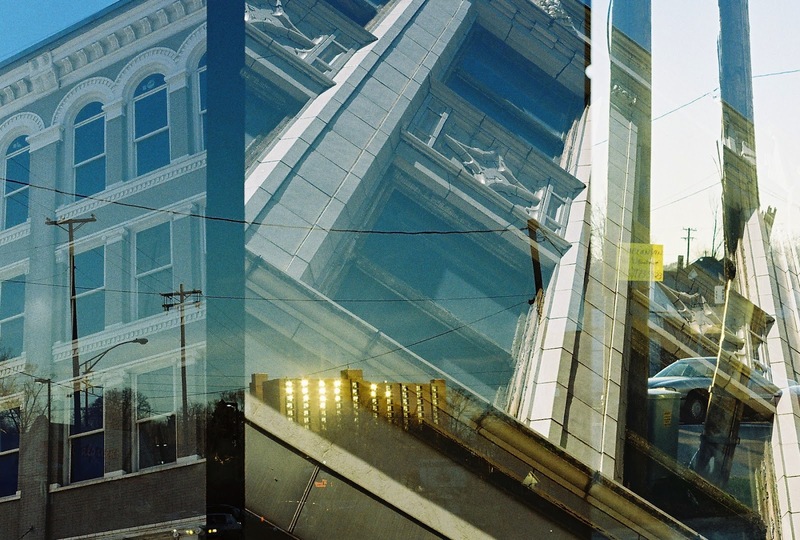 I decided to try my hand shooting older buildings and ended up submitting a mix of double exposures and TtV shots. Not one I submitted, but another image from the same roll. The second application I submitted was to the Arts and Culture Alliance of Knoxville seeking entries for their Arts in the Airport show. My work has been juried into this show twice before. 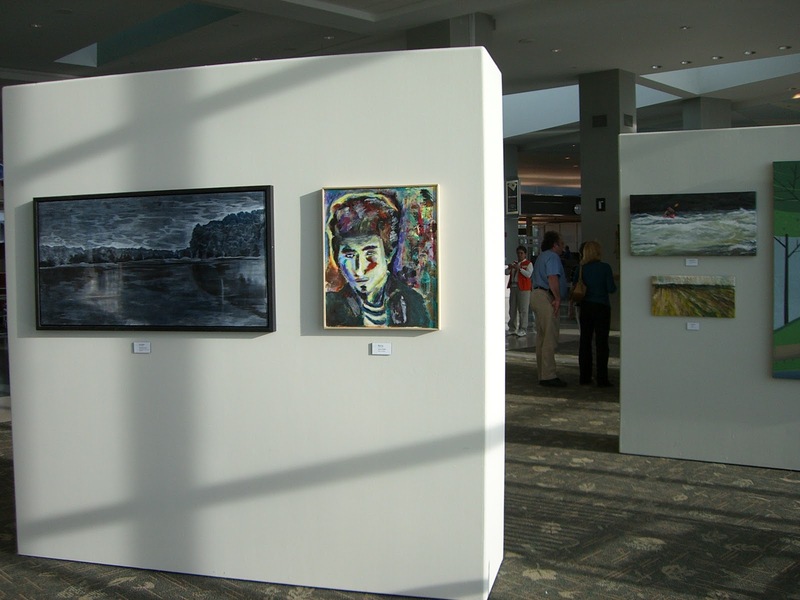 Both of my pieces are on the left sides of the walls -- the blue landscape and the smaller landscape. Typically, the alliance wants art of any subject matter and medium. The only restrictions really are in dimensions and weight of the entered pieces. I wasn't planning on entering this particular time because of a few sentences on the entry form. "In honor of the 75th anniversary of McGhee Tyson Airport, the spring and fall 2012 exhibitions will both share the theme 75 Years of Making Memories in Aviation. Interested artists are encouraged to broadly interpret the theme in their submissions for the spring exhibition. The fall exhibition will welcome submissions that have been especially created in response to the theme." I have no interest in planes really, and felt that anything I tried to make about aviation just wouldn't come out right, because I wouldn't be sincerely invested in the subject. Well, as it turned out, last Saturday night, some possessions I randomly acquired all got together and whispered, "Sarah, make plane art tomorrow." I'll explain. About a month ago, Knoxville had their Friends of the Library book sale. Lately I've really been plowing through saucy biographies. I enjoy them because, to be honest, the ones I pick out are like 400 pages of TRUE CELEBRITY GOSSIP. Exciting, historical, and always a little scandalous. I went to go stock up for the year. Impulsively, I passed through the reference book section. My mom is an English teacher and will never say no to another unique dictionary or book of etymology. Next to all the dictionaries were the atlases. For no distinct reason, I poked through them, and tossed the oldest one into my cart. Everyone needs a grossly outdated atlas with colonial overtones, right? It looked like it had some loose pages in the back. I assumed the binding in the back was completely blown and some kind person had stuffed Africa, Persia, and the Soviet Union back in before giving the book away. Boy, was I wrong. A month passed. My mom got her new dictionaries, and I finished Thomas Hoving's memoirs and began the biography of The Duchess of Windsor. The atlas sat in the corner of my living room with some sketch pads and pieces of wood. I don't know why, but I opened it on Saturday night and hit on the mother lode. Africa, Persia, and the Soviet Union were not in the back. 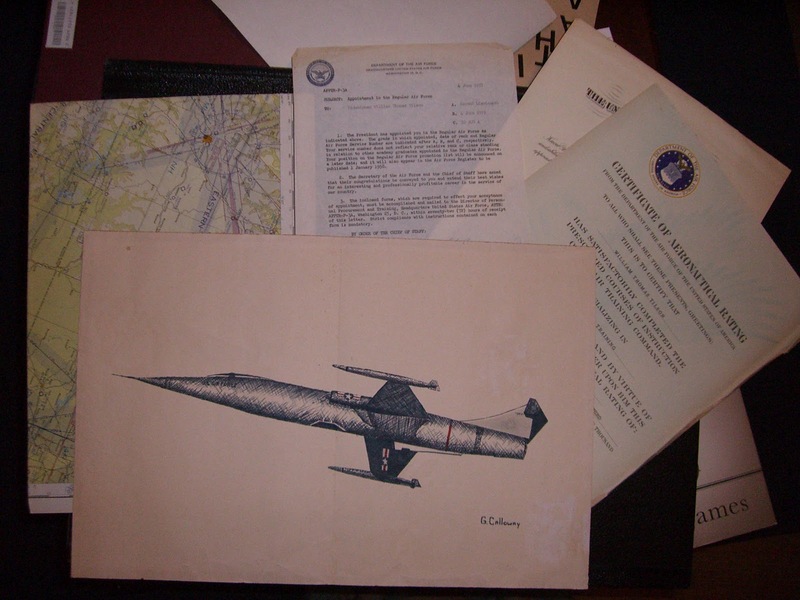 Instead, I found a bunch of plane things -- an almost-complete Aeronautical Chart of the Southeastern United States, an ink and marker drawing of an Air Force fighter plane, and the Air Force certificates and appointment letters for a gentleman from 1957. In the atlas was also a page showing air routes. How could I ignore all of this? I got up early on Sunday, made a giant pot of coffee, turned on NPR, and got to work. I knew I wanted to make something with the atlas, but I wasn't sure I wanted to cut it up yet, so I decided against using the actual Air Routes map page. However, the aeronautical chart was missing a chunk already, so I didn't feel so odd about cutting another piece from it. I briefly considered using the Air Force certificates and letters somehow, but also felt strange about that because I don't actually know the person they belong to. 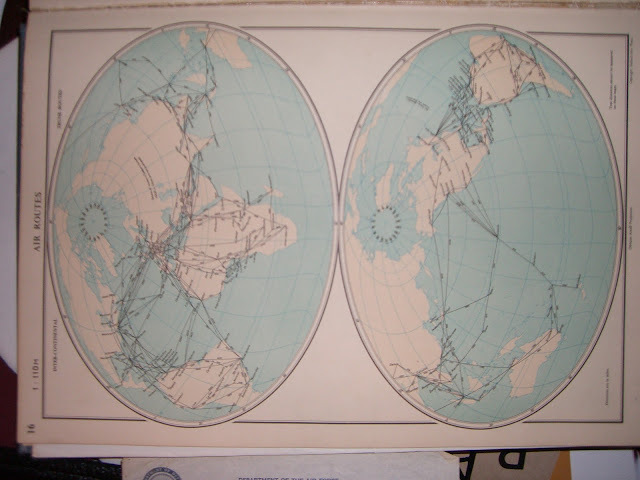 Eventually I settled on taking a piece from the aeronautical chart and combining it with what interested me the most about the Air Routes map -- the spider-like network of connecting flights from city to city enclosed in two connected ovals. I began the laborious task of tracing all of these lines onto tracing paper so I could transfer them to the aeronautical chart. I trimmed out and taped a section of the chart to my drawing board. A few layers of white paint and marble dust gave me the perfect ground to transfer my tracing onto. I spent the rest of the afternoon painting, and building up colors and layers of the map -- deciding to highlight towns and radio stations with the color yellow, emphasizing large circles that signified municipal airports, and tracing map lines with graphite. After about 9 hours, this was the end result. Everywhere you can fly in 1951. I approached plane art on my terms, and really enjoyed it. I have no idea of the results of either of these calls for art yet, but we'll see.